This polished gold cross is simple and straight forward, yet it carries a promise of God's grace that we can't earn. It is simply given because of His love for us. Made in 14K Solid White Gold. Cross pendant measures approx. 1" tall x just under 3/4" wide and 1.75mm thick (1 1/4" tall w/ hoop/bale). Also available in yellow gold, 18k gold, or platinum (shown below). 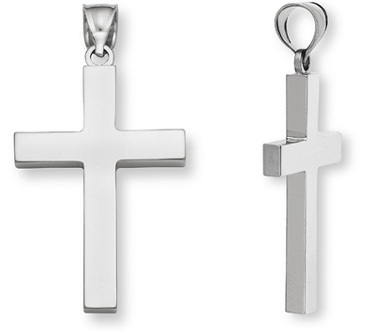 We guarantee our Plain 14K White Gold Women's Cross Pendant to be high quality, authentic jewelry, as described above.